When first I came to Scandinavia I worked for a Danish company based just outside of Copenhagen. In their cafeteria on every day of the week one could choose from several different types of pickled herring combined with various toppings and several different types of bread, many of them dark and grainy. I wasn’t wild about it at first, but it grew on me. I began to miss my pickled herring smörrebröd when I sat in London pubs – England was my other base during this phase of life. Now that I have been living in Sweden for 13 years, I know that the summer cannot pass without a jar of sill or pickled herring in the refrigerator. There are many types that you can purchase in the shops, prepared in almost every imaginable marinade. 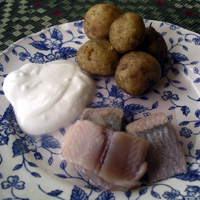 The classic in Sweden is to lay a few slices on a starter plate with boiled new potatoes (peel unremoved) and soured cream. It is an elegant and exotic start to a meal even if you come from these parts. Sill is also a highlight at Christmas although at that time of year served with crisp bread rather than potatoes….but that is too far away to worry about just now. Sill doesn’t feel like something you want to consume too much of at once. It has a richness as a result of the fact that herring is an oily fish and a strong flavor, imparted by the marinade, that makes small quantities in starter portions just right. For some years there have been health concerns about the consumption of herring from the Baltic sea which was heavily contaminated by PCBs (Polychlorinated Byphenals used in refrigeration), methylmercury and dioxin-like compounds during the 1960s and 70s. In addition, overfishing severely reduced herring stocks to dangerously low levels. The news for the Baltic seems positive, with sinking levels of these pollutants and collaborative efforts to control fishing. Still, best advice is to consume Atlantic or Pacific herring up to two times per week. If you are expecting, avoid consumption of fish from the Baltic entirely. The good news is that sill is one of three types of oily fish (the others are mackerel and salmon) rich in Omega-3 fatty acids which protect against heart disease, among other clear health benefits. These fish are a great way to get the healthy fats that your body needs without eating ‘fat food’. So, what is the trick for coming up with that tangy tasting sill that is one of the most common features of the Scandinavian smörgåsbord? Here is a basic recipe that you can vary according to taste and what herbs you’ve got available. You can consider adding other flavors such as juniper berries, sherry or garlic. Blend the vinegar, water and sugar and bring to simmering. Remove from the heat and allow to cool. During this time, chop the herring fillets into 2-3 cm or about 1 inch chunks and layer in clean jars with pepper corns, onions and bay leaves. Pour over the liquid so that it covers the fish and fills the whole jar. Seal and allow to marinade for 4 days. Serve with your favorite dark bread, potatoes, sour cream and perhaps, for that extra health and flavor kick, beet root salad. The possibilities are endless. Oh dear. “What is she thinking now?”, you might wonder. Isn’t a title like “The Rotten Cookbook for Good Health” just naturalness gone too far? No, not really although I do agree that a book with that title might not make the bestseller lists. This was just my crazy little way of calling your attention to the value of controlled fermentation in the kitchen for good health. Cultivating good bacteria in order to mature foods in ways that are good for our stomachs and that appeal to our palates is a very old art used in many parts of the world, including in the Nordic region. 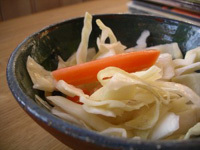 Lactic fermentation of root vegetables and cabbages is one good example. This technique was originally a means of preserving the vital nutrients that these vegetables could provide until the next warm season could deliver new nutrients. What is lactic fermentation? It means using the watery liquid (the whey) that is left when you drain out the creamy part of yogurt or other forms of ‘live’ dairy product. What is a ‘live’ dairy product? It is one that contains live bacteria good for maintaining your digestive flora (check the labels!). When I thought of “The Rotten Cookbook for Good Health”, I thought of a whole host of foods that would fit in. All kinds of interesting combinations of tasty vegetables that could be fermented and bottled, wonderful sourdough breads, home-made yogurts and more. The idea just gets bigger all the time! Place the chopped vegetables into a large clean glass or ceramic container that can be sealed. Pour over the whey (the milky liquid) that has been separated from the cream. Mix the vegetables into this liquid and place a heavy weight on them (I use my limestone rock paper-weight) so that they are compressed and just covered with the liquid. Seal and leave to ferment in a warm place in the house for 12 hours. Open and add salt water if the vegetables are not covered in liquid. The recipe for salt water is 3 tsps to one liter or quart of water. Place the weight on the vegetables again and seal. Leave in the same place to ferment for 3 days this time. After this time you can bottle the vegetables and liquid as you like and refrigerate or keep in a cool place. In contrast to most foods, these just improve with time! Consume as a side dish with almost anything. For extra seasoning, add in paprikas, onions and your favorite herbs such as rosemary or dill on the first day of fermentation. This makes a mean “rotten” side salad! Visit The Nordic Wellbeing Cookbook for a further selection of great recipes!